The Bundespressekonferenz was officially constituted on 11 October 1949. At the first press conference it organised, Federal Chancellor Konrad Adenauer and Minister for Economic Affairs Ludwig Erhard spoke to and took questions from the press. The founding of the BPK revived a tradition from the time of the Weimar Republic. Immediately following the end of the First World War, journalists from leading German newspapers themselves began to organise a daily conference that had until then been run by the military. When the National Socialists took power in spring 1933, they ended this practice and turned the Reich Press Conference into an instrument of propaganda and press manipulation. Following the Second World War the organisational form of the press conferences was revived. The first to be formed was the State Press Conference in Hanover in 1947, followed by the Frankfurt Press Conference of the Economic Council of the United Economic Regions in 1948. The latter is considered the direct forerunner of the BPK. A majority of its Frankfurt members moved to Bonn after the Federal Government and Parliament were established there in 1949. 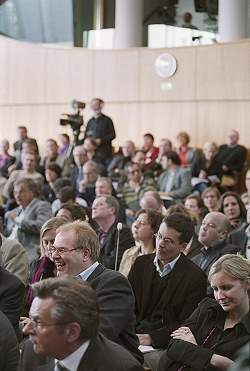 After the Berlin wall fell, in spring 1990 the BPK supported the founding of the Press Conference in the Capital Berlin, which became the Berlin Branch of the BPK soon after German unification. When the Government and Parliament moved to Berlin in 1999, the BPK also moved its main office to Berlin, but it is still represented by a branch office in Bonn.